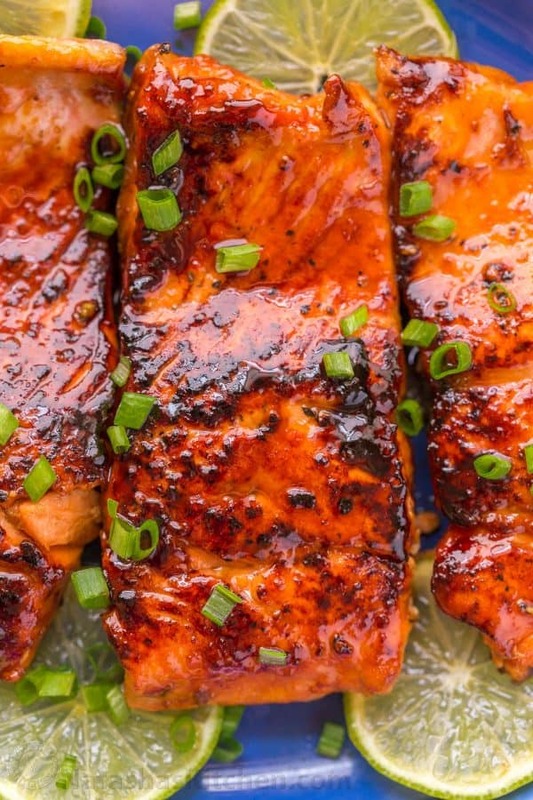 This honey-glazed salmon is juicy, flaky, and so satisfying! 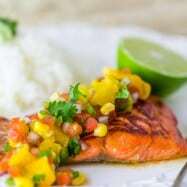 Squeeze fresh lime juice over this honey glazed salmon and serve with steamy, fluffy white rice. Mmm… mouth. is. watering!! 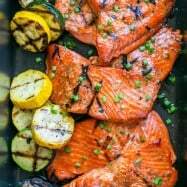 This idea for this salmon recipe was shared by one of my readers; IM. 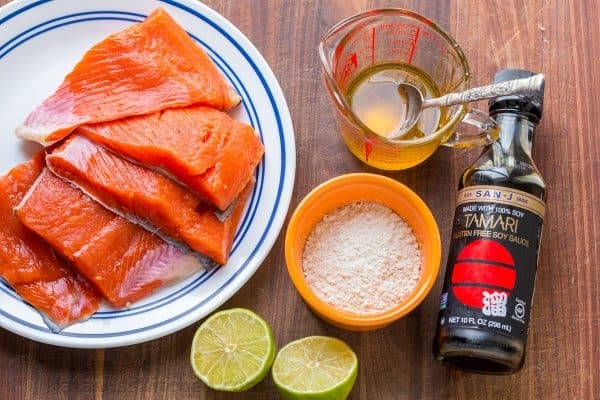 He wrote in with this honey soy salmon, saying, “honestly, best salmon I’ve ever had.” The list of ingredients is so short and simple. Between the easy prep and cooking, this is a 10-minute recipe with some seriously tasty results! I’ve made it twice in the past week and it got rave reviews! I hope you all enjoy it just as much as we did. 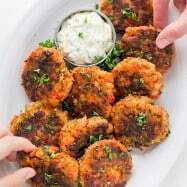 Thank you so much IM for sharing your tasty recipe with us! I recommend boneless, skinless salmon. 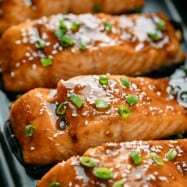 It can be done with skin-on if that is all you have and don’t want to take the time to remove it, but you lose some of the flavor when you remove the salmon skin later after sautéing it. Love Salmon? 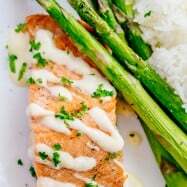 Check out our Most Popular Salmon Recipes Here! 1. To make the glaze: In a measuring cup, combine 1/4 cup honey and 2 Tbsp soy sauce. Stir until well combined and set aside. 2. 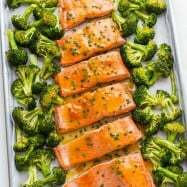 Season both sides of your boneless, skinless salmon filets with salt and pepper. Pour 1/4 cup flour into a shallow plate and dredge both sides of salmon in flour, shaking off excess flour. 3. Heat a large non-stick pan over medium heat and add 2 Tbsp light olive oil. Note: Do not cook over high heat or you will burn the glaze. 4. Brush the first side of salmon generously with half of the glaze and once oil is hot, add salmon to the pan (glaze-side-down). In the pan, brush the second side generously with remaining glaze. Saute salmon on the first side for 3 minutes, turn and sauté second side another 3 minutes. 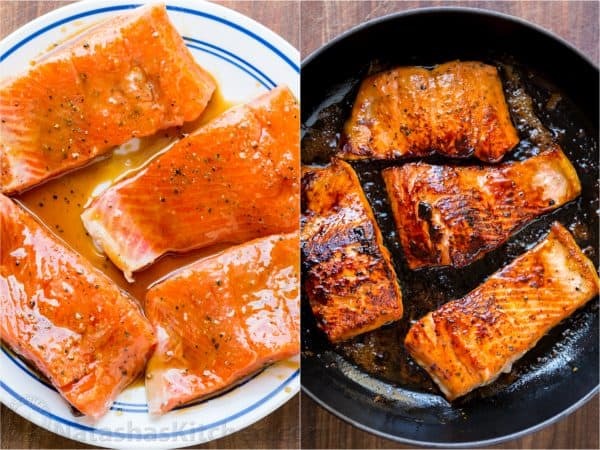 Glaze should be caramelized and salmon should be just cooked through and opaque inside when flaked. 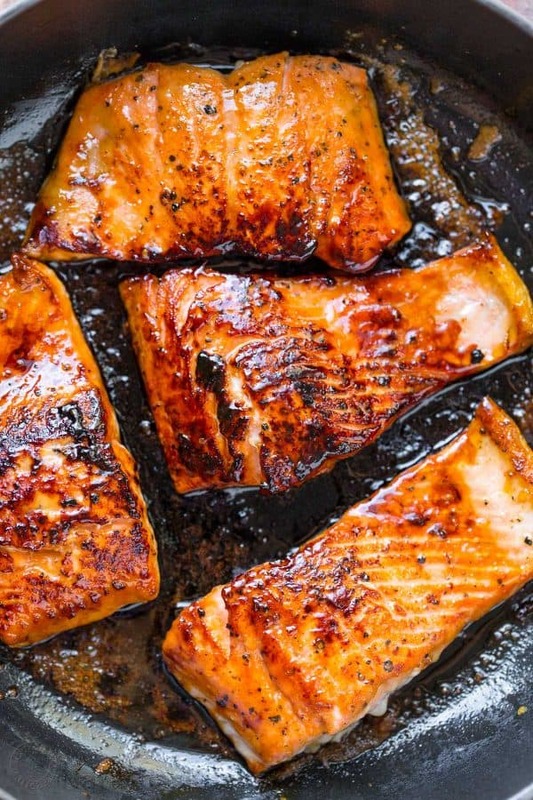 Cooks Tip: If salmon is browning too quickly, reduce heat so you don’t burn the glaze. Squeeze fresh lime juice over the top to serve and garnish with chopped chives if desired. 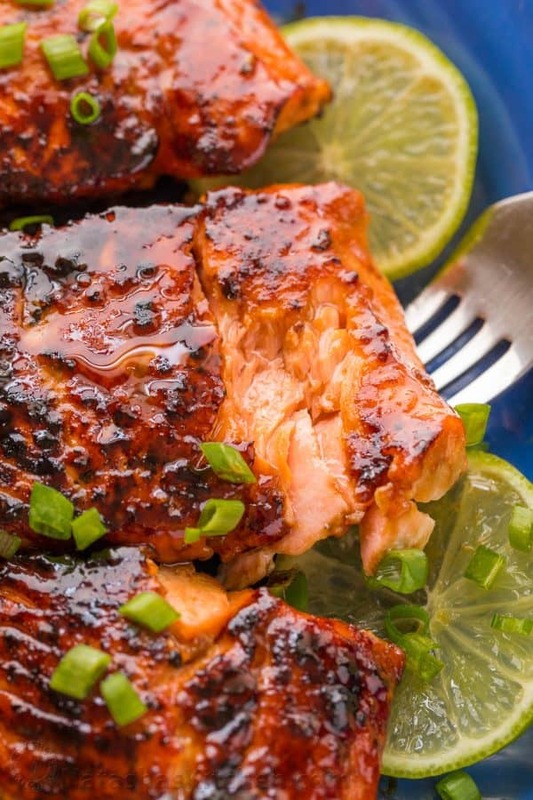 This honey-glazed salmon is juicy, flaky, and so satisfying! 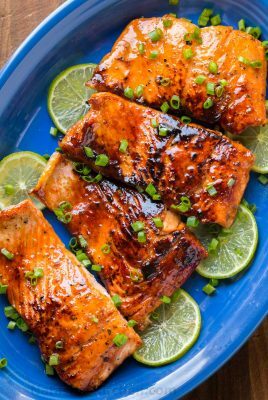 Squeeze fresh lime juice over this honey glazed salmon and serve with steamy, fluffy white rice. 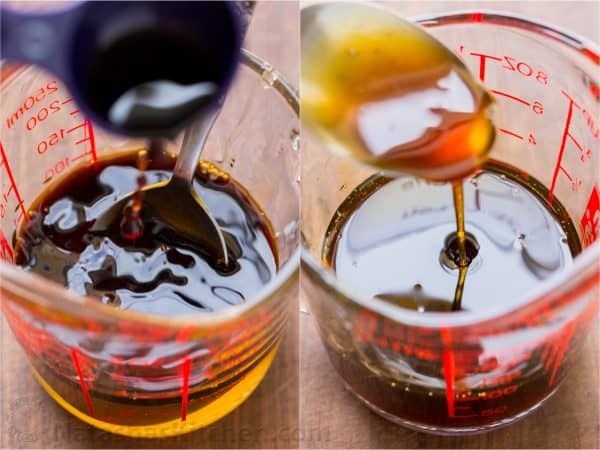 To make the glaze: In a measuring cup, combine 1/4 cup honey and 2 Tbsp soy sauce. Stir until well combined and set aside. Season both sides of your boneless, skinless salmon filets with salt and pepper. 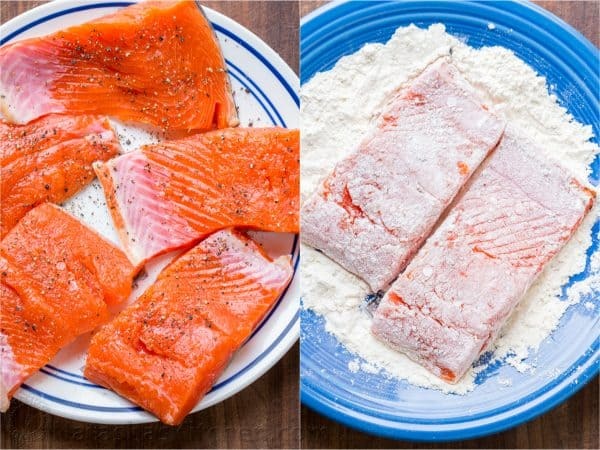 Pour 1/4 cup flour into a shallow plate and dredge both sides of salmon in flour, shaking off excess flour. Brush the first side of salmon generously with half of the glaze and once oil is hot, add salmon to the pan (glaze-side-down). In the pan, brush the second side generously with remaining glaze. Saute salmon on the first side for 3 minutes, turn and sauté second side another 3 minutes. Glaze should be caramelized and salmon should be just cooked through and opaque inside when flaked. *Do not cook over high heat or you will burn the glaze. Mmmm salmon is such a healthy and delicious choice. This was a wild-caught coho salmon which is sometimes hard to come by if you don’t live on the coast, so buy the best salmon you can find/afford. 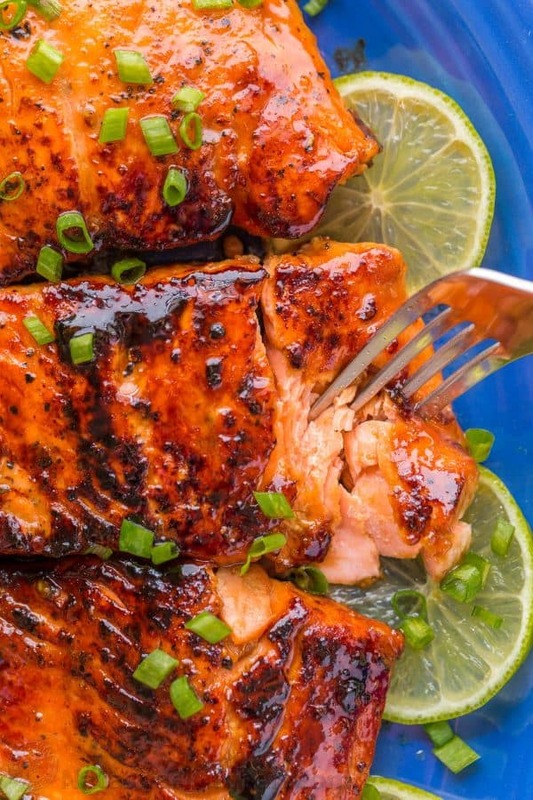 I hope you all LOVE this honey-glazed salmon. It’s unbelievably quick, easy and so delicious! And thank you IM for sharing this with us! I love it when you all write in with your recipes and suggestions and even when you correct my occasional blaring typos! Thank you for thinking of me and sharing your delicious ideas! If you have something you’d like to share, I’d love to hear from you in a comment below or via email: natasha @ natashaskitchen. com (no spaces). Some of our readers recipes have become our very favorite! I’m convinced I have the very best readers around! I’m constantly amazed by your generosity and thoughtfulness in the way you share your expertise and help each other in recipe comments. Thank you, my friends!! This is a great recipe, Natasha. I love how the sweetness of the honey combines with the saltiness of the soy sauce and the acidity of the limes. And the touch of chives brings it all together – I love chives! Made this for the 1st time tonight, and I will make it again, it was YUMMERS, even My Landlady who is really Picky ate it all… and Even commented about how Good it was, which is Very Unusual. Second batch turned out great! Was amazing! Served with creamy mashed potatoes on the side and an olive garden salad.